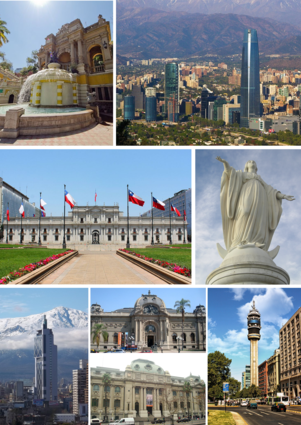 Collage of Santiago, left to right, top to bottom: Cerro Santa Lucía, panoramic view of Santiago, La Moneda, Statue of the Immaculate Conception, Torre Entel, National Museum of Fine Arts and National Library of Chile, Torre Telefónica, San Francisco Church and Estación Central Santiago Metro station and Railway Station. Peparab: "The City of the Island Hills"
Santiago iku ibu kutha uga kutha gedhé dhéwé ing Chili. Gunggung kang ndunungi 5.428.590 jiwa (2002). Wikimedia Commons duwé médhia ngenani Santiago de Chile. Wikiplesir duwé panuntun plesir ngenani Santiago de Chile.